1. Membership incentive - Scholarships of up to 50% of the dues fee are available for new members, lapsed members and those with circumstances make it challenging to renew. Applicants must have participated in at least three chapter meetings or programs to be considered. 2. 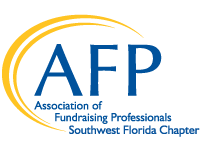 CFRE Credential Scholarship - The AFP Southwest Florida Chapter CFRE Credential Scholarship can be used toward the CFRE review course and study guide, CFRE test fees, or CFRE approved Continuing Education courses prior to test date. Funds are only available for two years of testing windows. Recipients are responsible for registration and/or ordering materials and submitting receipts to the AFP Southwest Florida Chapter. Scholarships of up to $500 are awarded. 3. Planet Philanthropy - Planet Philanthropy is the annual statewide conference presented by the Association of Fundraising Professionals Florida Caucus. The AFP Southwest Florida Chapter will award the early bird discounted registration rate. Recipients are responsible for registering for the conference and submitting receipt to the AFP Southwest Florida Chapter. 4. AFP Chamberlain Scholarship - One (1) scholarship of a registration fee to the AFP International Conference. This scholarship covers the registration fee with an exception of a $10 reservation fee, which must be paid by the scholar. The AFP Southwest Florida Chapter will provide reimbursement for travel, lodging and other meals (up to $500). Recipients are responsible for registering for the conference and making all travel and lodging arrangements and upon return, submitting all receipts to the Southwest Florida Chapter. Deadline: October 1st. If the 1st lands on a Saturday or Sunday, the application will be due the following Monday.